We live in difficult times. Daily life is not much affected yet, but our political life is in crisis, and national life is becoming bitterly divided. I am told that plans have been laid to meet civil unrest if Brexit either does or does not happen. Every day therefore we should be praying for our politicians in Westminster that they may be given the guidance to act in wisdom for the good of the nation, and that we will be led into a way forward which is sustainable and beneficial to the country. Christianity often badges itself as a religion of “Love”, and certainly that was the most popular epithet that was chosen when the Diocesan Conference was asked to sum up Christian faith in one short slogan a couple of years ago. The danger in that is that it could become no more than a religion of good feelings and of being nice, rather than something which is challenging. One of the biggest taunts of those outside the world of faith is that faith is a crutch, by which I suppose that they mean that God is seen as some sort of indulgent saviour in the sky who can be used as an excuse for the way things are, or to soothe us from worry about death and taxes. I suppose Marx meant something like that when he wrote of religion being an “opium for the people”. I believe faith has to be in touch with the hard places, and that runs two ways: firstly, that prayer should tackle difficult situations head on, praying about all things and facing up to the challenges of the world. Secondly, it is not an abdication of responsibility but a call to take up the cause of what is just and true and right. Far from being a crutch, stirs us from sloth to engagement in our own life and discipleship, to become advocates for justice and truth. That’s why I particularly like our Lent prayer this year. I hope you are joining me in saying every evening around 6pm. A brief note to mention that Martina has now finished work as my temporary PA, and that Sarah Broadbridge has taken her place. Martina’s emails are being forwarded to Sarah, but she also has her own email address. Siân and Michael continue to make a good but steady recovery, and I hope to have their support once again here in Esgobty before too long. We are keeping this observance once again as usual at 1100hr on Maundy Thursday, April 18th in the Cathedral with the celebration of the Eucharist for the Blessing of the Holy Oils together with our Renewal of Commitment to diaconal, priestly and episcopal service as well as the commitment of all the baptized to mission. This service is a genuinely diocesan event, and I stress again that all licensed and commissioned lay ministers and all members of our congregations are very welcome to this occasion in addition to all clergy, serving and retired. Clergy are requested as usual to robe in alb or surplice with white stole in the North Transept and then take a seat in the nave by 1050hr. Readers are also welcome to robe in surplice and scarf, while other licensed lay ministers may wear their cross, and members of the Order of St Asaph their insignia. We shall be sat in segments in the same way as last year, so please take guidance from the stewards as you enter the cathedral. Lunch will follow as usual, and will be served in the South Transept. It will take the normal form of a hot main course followed by pudding. Everyone is very welcome to stay for this, however we do need to have an accurate estimate to give to the caterers. Mission Area Leaders have been asked to collate the numbers of those requiring food from their area and to have submitted their numbers to Esgobty no later than Friday, March 29th, but there may yet be a few stragglers. A diocesan Confirmation will be held in the context of the Cathedral’s Easter Vigil once again. Sarah is making contact to complete the list of candidates who will be presented, and anyone who has candidates is asked to submit details to Esgobty as soon as possible. The Vigil itself is a wonderful service (imho), but made better by a large attendance. Priests presenting candidates should encourage as many of their congregation as possible to attend in order to support those being baptized or confirmed, as the congregation can sometimes be a little thin and unexperienced in liturgy if it is restricted to the family and friends of the candidates. We also encourage the practice of Mission Areas with candidates supporting the service, and bringing the paschal candles of the mission area with them to the liturgy. These are lit from the Cathedral’s paschal candle and processed out ahead of the recessional, as we carry Christ’s light out in mission to the world. It adds greatly to the symbolism. So – all are welcome and invited to support this service, especially if the Easter Vigil is not celebrated in your own Church. It is now time to start inviting nominations for the Order of St Asaph in 2019 as we seek to recognise and honour the outstanding contribution of lay persons at diocesan level, particularly at an appropriate point on the completion of service in a particular way or in a particular role. Admission to the order is marked by the presentation of appropriate insignia, and those admitted to the order are listed on the diocesan website. 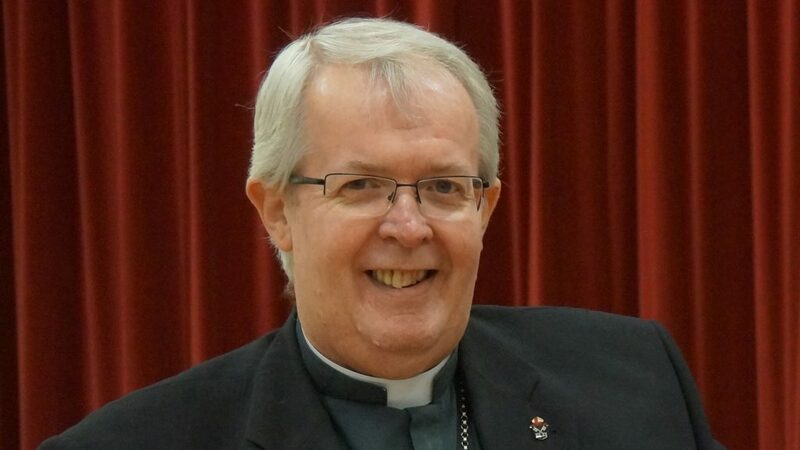 The Order of St Asaph Nomination Form should be returned completed with as much information as possible about a candidate’s contribution to the diocese. All members of the Teulu Asaph, whether clerical or lay, are encouraged to make nominations, which can also be submitted through any diocesan council or committee. Nominations forms should be submitted to me at Esgobty by the end of April, and will be referred to the advisory committee who will meet in early May. The admission to the Order will take place at Choral Evensong in the Cathedral in the Autumn, so watch this space for the date. Understandably there are those who have offered sterling service to the church within a church / mission area context. Whilst the Order of St Asaph is intended to recognize diocesan service, I am happy to be approached about someone’s outstanding contribution to local church life that should be recognized. I will be happy to issue a suitable certificate that can be used by the particular church or the mission area for a local presentation. Please contact Ian or Michael at Esgobty in the first instance with appropriate details for me to consider. 07 April 15:00: Licensing of Juliet Fraser as Priest-in-Charge in the Aberconwy Mission Area, All Saints’ Church, Deganwy. I am delighted to announce the appointment of the Revd Jayne Coxall as a priest-in-charge in the Aber Morfa Mission Area. Jayne comes to us from Bredbury, across the border in Chester Diocese, and we look forward to welcoming her in July. I wish you all the very best for Passiontide and Easter. May you be refreshed in every way in this holy season.